Hugh Masakela on Mountain Stage at the Charleston Sternwheel Regatta on September 3, 1989. 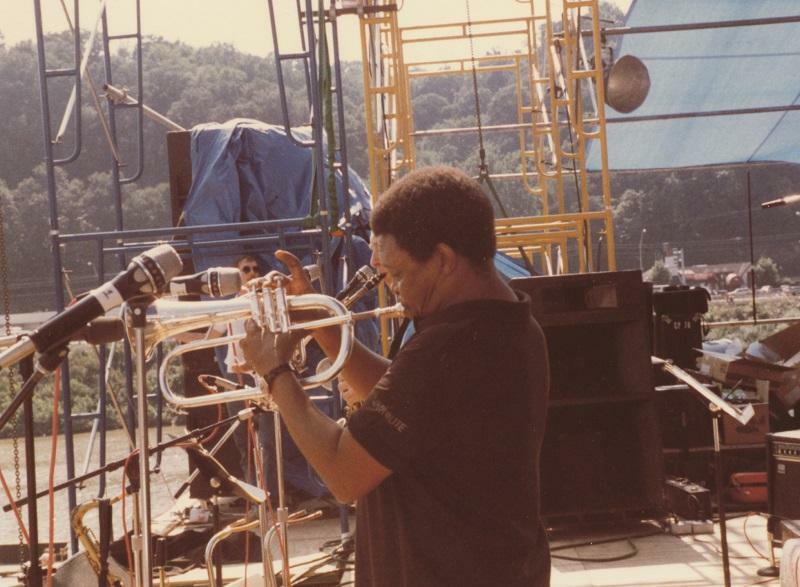 Hugh Masekela performs "Bring Him Back Home" on Mountain Stage at the Charleston Sternwheel Regatta on September 3, 1989. In September of 1989, Hugh Masekela made his first appearance on Mountain Stage, bringing with him the rhythm of traditional South African music intertwined with the sounds of classic jazz. Through rhythms that made it easy to sway to, Masekela expressed the distress of his country at the time, singing "Bring Him Home", a cry for the release of Nelson Mandela. Masekela left South Africa in 1960, following the political unrest of the Sharpeville Massacre. Making a home in New York, he fell in love with the jazz community. Encouraged by greats like Miles Davis, Masekela pioneered a blend of American Jazz with traditional sounds and instruments of his home country. In 1994, he returned to West Virginia for Mountain Stage, two days before playing "Bring Him Home" at the South African presidential inauguration of Mandela. This would mark the end of his self-imposed exile from his homeland that had lasted over thirty years. "The second appearance was on May 8, just two days before Nelson Mandela was inaugurated as President of South Africa. The spirit on that show left a deep impression on all of us." – Larry Groce, host and artistic director, Mountain Stage. Masekela performing the same song on May 8, 1994 on Mountain Stage. “I am deeply saddened to read the news of Hugh Masekela's passing. We had the pleasure of having Hugh on our show a couple of times. The first time Nelson Mandela was still in prison. The second time was just before the inauguration of Mandela as President of South Africa. I was driving Hugh to our local airport, so he could begin his journey back "home" to take part in the inauguration festivities. As we were making our way to the airport I told him I never thought this day would come. He was looking out the window and, after a few seconds, he turned to me, with tears in his eyes, and said "...I wasn't sure it would happen either, Andy." My condolences to his family and friends. Here's to a great musician with an enduring legacy. May we keep his horn of freedom and justice blowing!” – Andy Ridenour, founder and past Executive Producer of Mountain Stage. We can recommend this archival interview posted by PRI's The World and NPR's remembrance of Hugh Masekela.